Looking for a DIY gift idea for parents? We love photo crafts in our house and finding unique ways to display photographs. 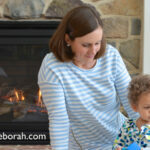 When our family celebrates holidays or birthdays we love to get the little kids involved. Today I’m sharing a fun DIY gift idea for parents or grandparents from the kids. 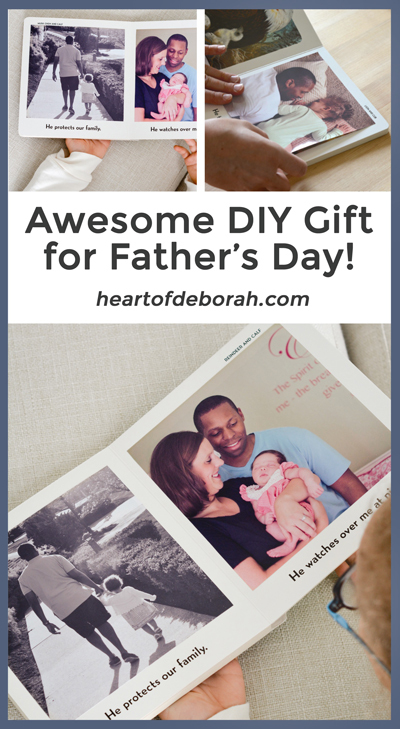 We made this gift for my husband last year on Father’s Day, but you can create this for any special occasion! Bonus, your kids will love it just as much as the adults. 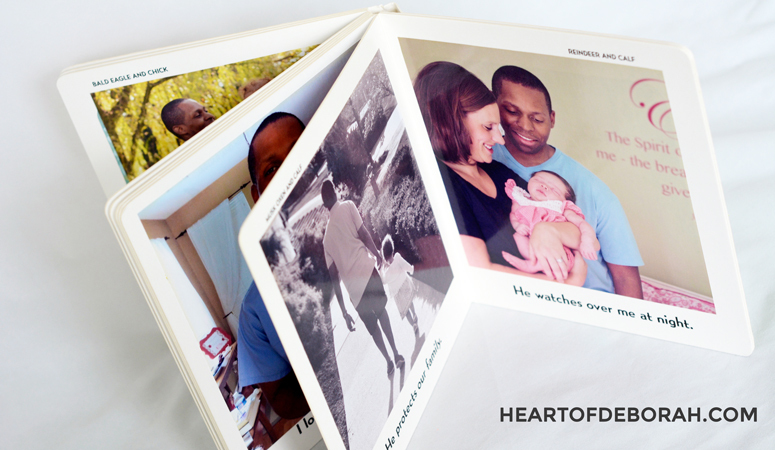 Essentially you personalize your favorite board book with pictures of your family. This would be adorable for grandparents to read with their grandkids or parents to read with their children. It’s one of a kind and memorable, you can also get the kids involved when creating the gift. For that special dad in your life, I found the perfect board book to insert your own pictures. 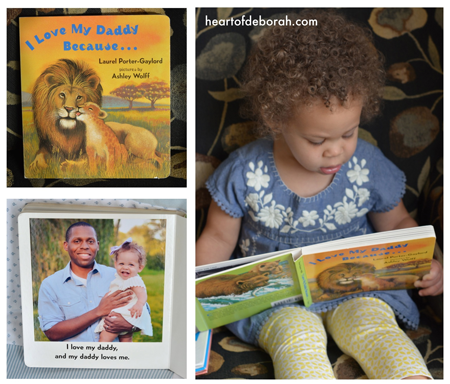 There is nothing like reading with daddy and creating a personalized board book to last a lifetime. You can use any children’s book you would like to create your own story. 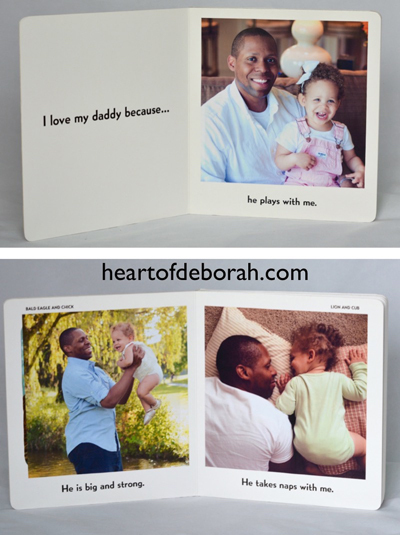 For this example, I used the I Love My Daddy Because… board book because I loved the text and I thought it was easy to find pictures to correspond with the story. The text includes “He keeps me safe and warm. He brings me dinner.” For those pages I used a picture of daddy and Izzy snuggling and a picture of daddy giving our baby girl her first bottle. 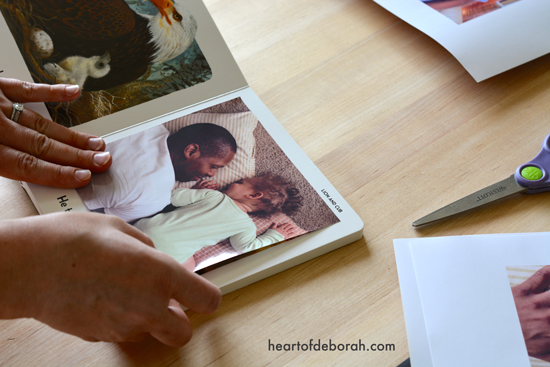 After you decide which children’s book you will use, find your favorite pictures of daddy, mommy, grandma, or grandpa and the kids. You can have your kids help you chose their favorite photos. Again, I tried to find pictures that correlated with the text. Not everything was a perfect match, but I figured Izzy and daddy would love it either way. This book in particular had pages about playing, singing, napping, etc. 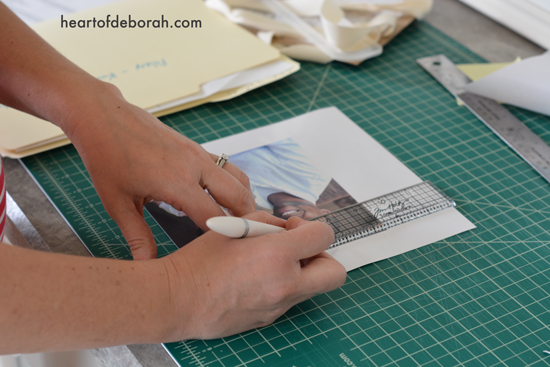 After you find your pictures, measure how large the photo area is in the book. For me, most of the pages required a 6 in x 6 in photograph. I cropped each picture on the computer to fit the corresponding page. Then I printed the photos on Glossy Inkjet Photo Sticker Paper . This paper is amazing. After you print it, you peel off the sticker and it easily adheres to the board book. I have to say sticker paper, it isn’t the absolute best photo paper, but it made the process so much easier compared to using mod podge. After I printed the pictures I used an X-ACTO knife to cut the pictures to size. You can also use scissors, whatever works best for you. Then peel the sticker off and put your pictures in the book. It’s as simple as that! Izzy LOVES the book already because it features her favorite people. I can’t wait to give it to her daddy on Father’s Day. Here are some of our favorite daddy and daughter books from last year. This is such a sweet present idea! I need to get some new ink for my printer. What a wonderful idea! This is sure to be a favorite for years to come! Aw yay I’m so glad you are going to make this! We still read it. We used iPhoto on a Mac computer to crop the photos. What type of computer do you have? Do you have an editing program? You may even be able to crop it on your phone as a square. Then when you print put the settings to print 6 x 6.